I smiled when I saw this design from the Oscar De La Renta Spring/Summer 2014 collection as it reminded me of my Garden Fairy’s Wardrobe dress that I created for my very first Petal & Pins post in September 2012 . The Oscar De La Renta dress is made from crushed pleated silk taffeta and tulle, my Fairy’s dress was made from a peony flower! The big voluptuous blooms of the tree peony are a favourite of mine and I’m lucky they were a favourite of a previous owner of my garden who long ago planted two. That’s the thing with favourites you keep coming back to them or you want more – choosing the same dish at a favourite restaurant, revisiting a holiday destination or wearing some things from your wardrobe more often than others. 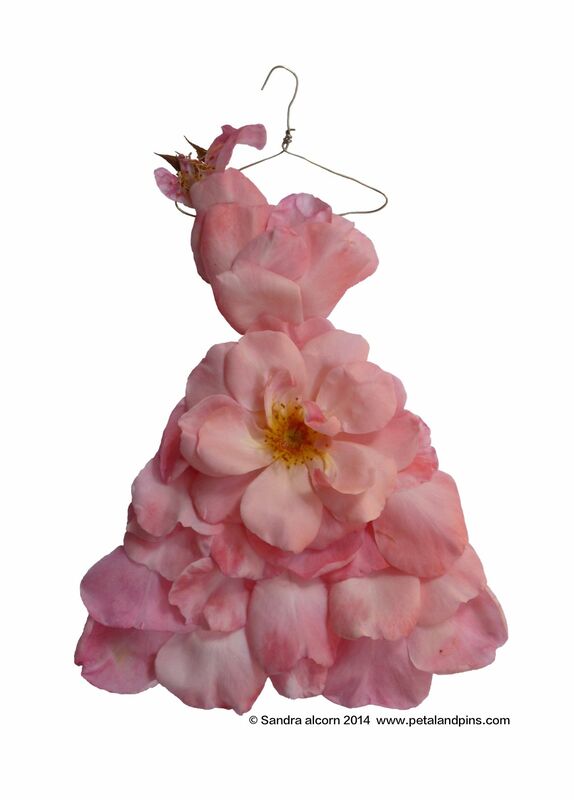 Sometimes fashion labels repeat a popular style in a different fabric or colour the following season, I certainly do that for some of my clients and I have done that here for my Garden Fairy’s Wardrobe – recreating my peony dress with roses.